The above cartoon recently popped up on my Facebook feed. It’s by the Rev. Jay Sidebotham, and depicts ‘the Advent police’ citing people for putting up Christmas ornaments and singing Christmas carols during Advent. Silly, right? Normally I would just chuckle and keep scrolling, but for some reason this particular image made me stop and really look. 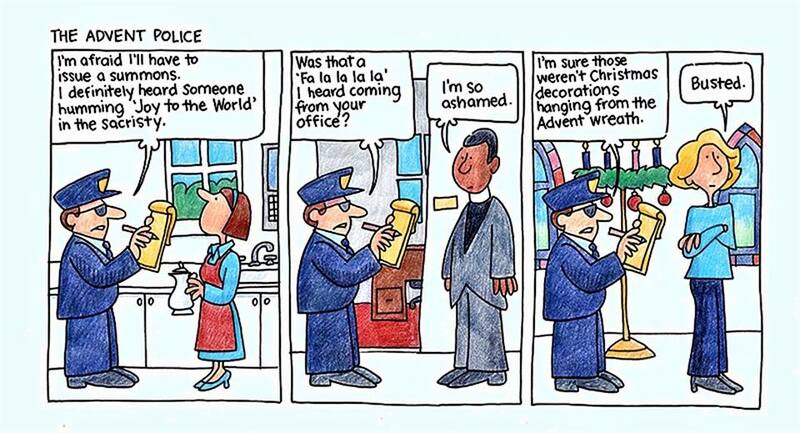 Can you imagine if there really WERE an Advent police? I know for a fact that the dollar store downtown would be awash in violations, since I’m pretty sure I recall the Christmas aisle being set up the week before Halloween this year. Think of all the fines that could be set aside for mission funds! (Just kidding.) Then again, how many of us are really able to go the entire four weeks before Christmas without trimming the tree or humming a few bars of ‘O Come, All Ye Faithful’ when we hear it played over the store loudspeakers while doing our Christmas shopping? As a former (recovering?) church organist and cantor, I find Advent to be one of the most fascinating times in the church year. Though the calendar year is drawing to a close, it’s just the beginning of the liturgical year – a time of quiet, preparation, and yes – anticipation of the coming Savior. The days are shorter, the hymns on Sunday a bit quieter than during the season after Pentecost, and the readings talk about waking from sleep and preparing the way of the Lord. One hymn in particular makes me marvel every year: ‘O Come, Divine Messiah’. If you’re not familiar with the tune, please do look it up on YouTube. The music is light, just a tiny bit bouncy, but combined with the lyrics it’s an amazing summation of the anticipation and longing of the Advent season. We wait in the dark and quiet of these weeks of December, yearning for Jesus to come to Earth for our redemption and to bring joy and light into our lives. It’s a busy time of year, and many of us have to-do lists as long as our arm, making our physical preparations for the coming of the Lord. Try to take a few moments this week, though, to quiet your mind and enjoy that thrilling anticipation that comes from having to wait. Megin Sewak is Communications Specialist for the Diocese of Northwestern Pennsylvania. This entry was posted in Advent, hope, Humor and tagged Advent, humor, Music, Rev. Jay Sidebotham. Bookmark the permalink.